There’s an old saying that says when the going gets tough, the tough get going. Wishing to take destiny into their own hands, many employees are leaving the uncertainty of the corporate world to start their own janitorial franchise. Like taxes and sunshine, companies will always need a janitorial service to help keep their offices pristine and beautiful. And nowhere is this more evident than in the office carpets. There are three steps to maintaining clean, great looking carpets: vacuum frequently, clean up spills promptly, and once a year hire a professional carpet cleaning company that specializes in steam/hot water extraction to clean the carpets. Knowing this is the secret to having a successful janitorial franchise. Dirt dulls a carpet’s surface and causes matting. Dirt comes in a variety of causes: air pollution, toxic outdoor vapors such as new asphalt and car exhaust, and the most common, on the bottom of everyone’s shoes. Walking on dirty carpet works dirt and dust deep into carpet fibers. Once there, not only does dirt become more difficult to remove, it can actually damage the carpet. The best weapon in the janitorial franchise war against dirt is a really good vacuum cleaner, one that adjusts to carpet or rug height and has gentle yet strong suction power. Less expensive vacuums pick up surface dirt and nothing deeper, and can actually contribute to dulling down and aging a carpet. When vacuuming, use the suction setting best for the carpet or rug in question and adjust the vacuum brushes to the correct height. Start vacuuming from the center and work your way toward the edge. Vacuum with the pile grain to remove surface dirt and against the grain to remove deeper, embedded particles. To finish up, if you’re vacuuming a rug, vacuum under the edges to pick up dirt that might have slipped underneath during the process. Another way to tame dirt and dust in a janitorial franchise situation is to place door mats in high-traffic entryways and areas. Practical rubber mats and decorative indoor/outdoor mats reduce the amount of dirt and dust, and thus allergens that enter a building. In a janitorial franchise environment, spills are inevitable and must be cleaned up quickly. The sooner a spill is removed, the less time it has to penetrate and leave a stain. To clean up a spill, remove as much of it as possible by blotting. Use club soda to saturate the area, and then blot and dry as much as possible. Always blot from the outer edge toward the center to prevent spreading. Never scrub or rub, as this actually works the spill deeper into the carpet fibers. For stains you can’t remove, call in a professional carpet cleaning company as part of your janitorial franchise service. In the life of every carpet or rug there comes a time for a good, professional carpet cleaning. For most carpets, this is once every 12 months, more often in high-traffic areas or for lighter colored carpets or in compliance with the manufacturer’s warranty. 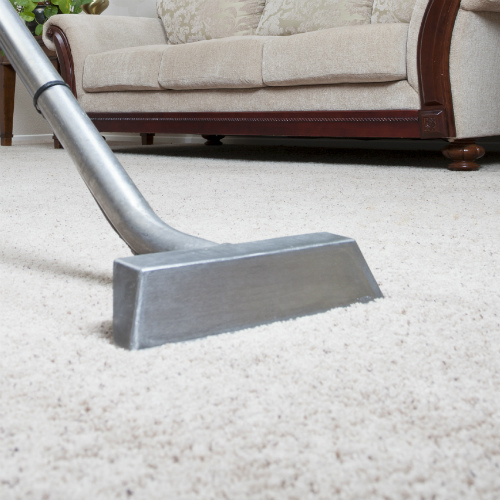 When considering a professional carpet cleaning service, look for a company that uses steam/hot water extraction only. Beautiful carpets beautifully maintained are a joy to behold and with proper care can remain a thing of beauty for us to enjoy for many years to come.